NPR News Nuggets: Sharks, Swans & Bears! Oh My! Here's a quick roundup of some of the mini-moments you may have missed on this week's Morning Edition. 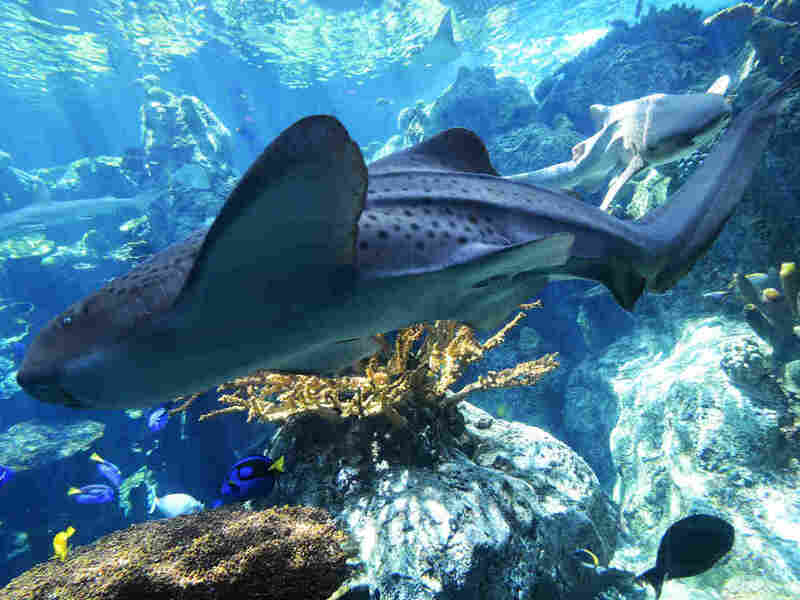 Zebra sharks are one example of an animal that can reproduce sexually and asexually. Don't cry for me, Susanna. Cry for the long-time Charger fans and their out-of-date tattoos. As Morning Edition host Rachel Martin said, the San Diego Chargers announced that they're moving to Los Angeles for the 2017 season. And unfortunately, their fans are not moving with them, but their fans' tattoos? Well, that's a little bit tougher. Tattoo parlors are coming to the aide of the fans though. Think of them as third-string quarterback, coming to to relieve the other two after a catastrophic 3 quarters. The parlors are offering discounts to help people get through this "painful endeavor" by refashioning the Chargers icons into something else. Turns out team love isn't forever, only diamonds are. Put one foot in front of the other and soon you'll be walking out the door. Well, unless you're this swan. As Morning Edition host David Greene said on Monday one swan decided to ruffle some feathers of those on a commuter train outside of London. For two miles the swan waddled along the tracks with the train slowly crawling behind it. After a much delayed commute, the British news site Metro reported one man got onto the tracks and waved his laptop at the swan who was finally captured. Before you go there, no harm came to the bird. It was released and apparently apologized for its transgressions. Now mosey along. There's nothing else to read about birds here. She don't want no scrub. A scrub is a shark that can't get no love from her. Honestly, that's what I believe Leonie said. As Morning Edition host David Greene said on Tuesday, Leonie is a proud zebra shark mom, who gave birth to three baby sharks last year. But unlike the campfire song "Baby Shark," these babies did not have a daddy shark. In fact, Leonie didn't have any contact with a male shark before this set of three was born. So here's a fun fact: the British magazine New Scientist reports that occasionally some animals that reproduce sexually can also reproduce asexually. Sharks are included on this list. However, this usually happens when a female hasn't made contact with a male before. That's not the case with Leonie. She had many little baby sharks with a male partner. He probably tried to holler, again, but his game was kinda weak and Leonie decided she didn't want any of his time and she went her own way. Your child couldn't paint that, but maybe your bear could. This is, assuming of course, if you had a bear. Then maybe your child could sell your bear's paintings to potential buyers at exhibit openings. And then your bear would hibernate? Yes, you're with me now. Now as Morning Edition host Rachel Martin said on Wednesday, that is basically how one Finnish painter operates. Juuso — the artist himself — is a 900-pound brown bear and he has his paintings on display in Helsinki. Eleven original works of art can be seen and some of his prints could be yours. That is if you're willing to spend some cash as some of his prints have sold for more than $4,000. Yeah, that's not chump change. What's better? Some paintings feature some bits of Juuso's fur. Fur-real though it's bear-y cool.